Two goals apiece by senior assistant captain Danny O’Regan and freshman Jakob Forsbacka Karlsson and four assists by freshman Charlie McAvoy led #9 BU to a 5-4 win over a stubborn UMass squad at Agganis Arena. The win gave the Terriers a two-game sweep of its opening round series and they now move on to to a best-of-three quarterfinal against Lowell at Tsongas Arena. On the heels of Friday night’s defensive battle, last night’s contest saw BU take the lead four times only to have the Minutemen respond to tie the game each time before JFK scored the game-winner. The center from Stockholm also scored the game’s first goal, assisted by O’Regan and freshman Jordan Greenway. Later in the opening period, Dennis Kravchenko’s rip from the high slot tied the score at 1-1. In the second period, BU scored a power play goal as captain Matt Grzelcyk’s cross ice pass was one-timed from the left-wing circle by O’Regan. Thirteen seconds after BU killed a UMass power play, Shane Walsh beat senior Sean Maguire from close range to restore the deadlock. Just a minute later, McAvoy set up Grzelcyk for a wrist shot from the left point that beat Nic Renyard, who was screened by Bobo Carpenter. 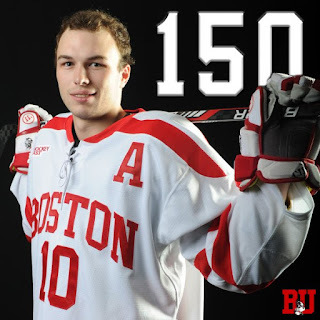 The Minutemen answered on the power play at 17:50 of the second when Kurt Keats converted a centering pass at the goalmouth, but BU responded quickly. Greenway controlled the puck along the end boards and found O’Regan driving to the net for his second of the night and 16th of the season, giving BU a 4-3 lead after two periods. Four minutes into the third period, UMass knotted the score yet again. Maguire blocked a long slapshot, but Austin Plevy beat the BU defense to the rebound for a goal. The game-winner came with eight minutes left in regulation when O’Regan set up McAvoy for a shot from the high slot that hit a defender. JFK corralled the rebound and, on his second attempt, beat Renyard to the glove side. "He was hard on the puck, he really was elusive, did a lot of good things, made some good passes, I thought he had a really good night." McAvoy’s four assists give him 20 for the season and 23 points. The victory was the final game of the season at Agganis, where BU racked up a 14-2-2 record. 2018 recruit Tyler Weiss assisted on a pair of goals in the Don Mills Flyers’ 4-0 playoff win over Vaughan. Weiss, named earlier in the week to the 2016 NTDP evaluation camp roster, has 45 points in 35 games for the Flyers. Jack Eichel scored his 19th goal of the season and added his 25th assist for Buffalo, but the Sabres dropped a 3-2 shootout decision to Minnesota. Eichel also gave his team a 1-0 lead in the shootout that was matched by the Wild’s Charlie Coyle before Minnesota got the deciding goal. #3 seed BU defeated #2 seed and 6th ranked Northeastern, 4-3, in the Hockey East semifinal. With the victory, the Terriers will defend their conference championship on Sunday against top-ranked Boston College. BU has won the past four Hockey East championships, including last year’s title game against the Eagles. After the Huskies took a 1-0 lead, sophomore Rebecca Leslie scored on a power play. Fellow sophomore Victoria Bach’s 22nd goal gave BU its first lead in the middle stanza before Northeastern tied the score. Captain Kayla Tutino put BU ahead to stay late in the period. Junior Alexis Crossley scored the eventual game-winner midway through the third period before NU scored an empty-netter. Sophomore netminder Erin O’Neil turned away a career high 54 shots, including 18 in the final period.